A leisurely stroll along one of Texas’ public beaches might include finding a sand dollar or two. But at Matagorda Island WMA—you can pick up dozens of sand dollars, as well as giant Atlantic cockles and even shark’s teeth. Shells are abundant on the island. And don’t be surprised if while sifting through the sand, you feel like you’re being watched. It’s not uncommon to look up from your collecting pursuits to see members of the island’s white-tailed deer population a comfortable distance away, keeping tabs on your every move. Or perhaps one or more of the 300 species of migratory birds that visit the island will fly in for a closer look, waiting to see what your efforts uncover. During fall and winter, you might even see endangered whooping cranes. Be mindful of when you visit, as the island is popular with hunters during whitetail season. Matagorda Island WMA consists of nearly 57-thousand acres and is an offshore barrier island. All interior access is via hiking, biking, or TPWD vehicles during scheduled hunts or tours. No private motorized vehicles! There’s more information on the TPW website. Out show receives support from RAM Trucks: Built to Serve. 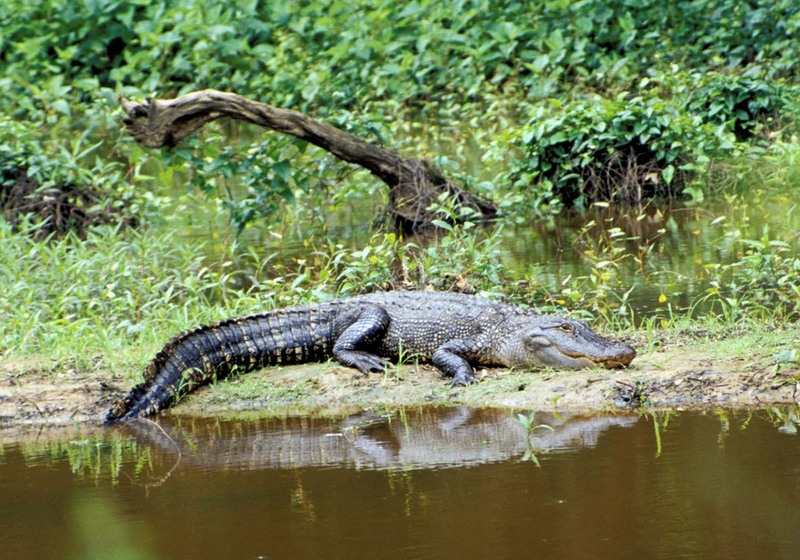 It’s a hot muggy afternoon in the marshes of east Texas; and that’s where we find hunters on the trails of alligators at J.D. Murphree Wildlife management Area. The area that we’re hunting in, it’s a vast bayou of swamps and marshes, with canals running through. The adrenaline rush is way more than deer hunting or anything else because you’re after something that can actually get you. /There’s one probably about 10 foot and two seven footers right up here. In about 150 yards we’re going to try and put a set. / Never been gator hunting before. You know you see ’em on TV. See the alligator shows. And, this is exactly what it looks like. / Our bait is chicken thigh quarters/ Those smell savory. /It’s savory; thats for sure. Mmmm./And we let ’em sit out in the sun for a day or two and it got quite ripe./Upwind is better than downwind when you get those things out. [distant laughter] I am amped up; adrenaline’s pumping, and then it’s on!/ Alligator hunting — it’s just not like anything else I’ve ever done. You know, there’s one on the line and you start pulling me in. I don’t know. You get anxious, you get excited. You get nervous. 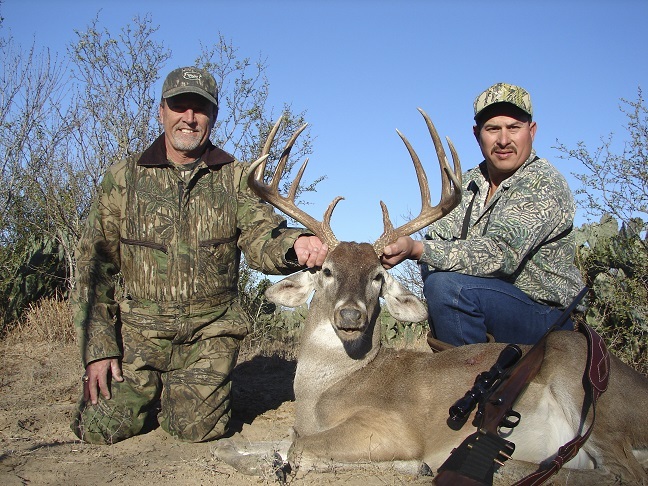 Trophy buck taken by Tom Roughton with guide Rene Garza. As you round a bend during a hike, you spy a buck with large, flawless antlers. Your heart races; your breathing becomes shallow; your nerves tingle. Hunters call this: buck fever. And it’s caused by the sight of perfect antlers. Nice smooth lines, tall tines coming off the main beams; very symmetrical one side to the other. John Stein knows a thing or two about perfect antlers; he’s curator at the Buckhorn Saloon and Museum in San Antonio. Antler and taxidermy covered walls draw visitors to the saloon by the thousands. Overall, in the collection, there’s over 12-hundred trophies that are on the walls –of all difference species. Some hunters shell out big money to landowners to bag trophy animals on their property; money the landowner funnels into management and conservation. For 25 years, deer experts at the Kerr WMA have studied the genetic and nutritional aspects of antler growth in bucks, and shared the data with landowners; biologist, Gene Fuchs. The information that we’ve gained from this study shows that through selection – by never allowing a buck that was a spike to ever breed a doe – we produced no spike antler yearling bucks two years in a row. And, the percentage of good quality antler yearling bucks has steadily increased. Opening day for deer season in the north and south zones is November 3rd. The Wildlife Restoration program supports our series and funds whitetail research in Texas. The excitement mounts as hunters across Texas await the November 3rd deer season opener. None are more eager than those who plan to participate in the annual Muy Grande Deer Contest–the granddaddy of all deer hunting contests. Read about it in an article by John Goodspeed, in the November issue of Texas Parks and Wildlife Magazine. Goodspeed captures the thrills and disappointments of the final day of the competition–the last day of deer season. Hunters continue to vie for dominance in multiple categories until the final hour. They agonize as they watch their rankings rise and fall on the leader board. Leonel Garza founded the contest in 1965. Operating out of his family’s gas station and convenience store in Freer in South Texas, Garza started Muy Grande to celebrate the bounty and quality of white-tailed deer in his region. He says South Texas Deer are as wide as the Rio Grande and as big as the state of Texas. The contest and Mr. Garza have been honored at the Texas State Capital contributions to whitetail conservation, deer management, and major economic contributions to the state of Texas and South Texas. Catch the excitement when you read John Goodspeed’s article on the Muy Grande Deer Contest in the November issue of Texas parks and Wildlife magazine. On Newsstands now. 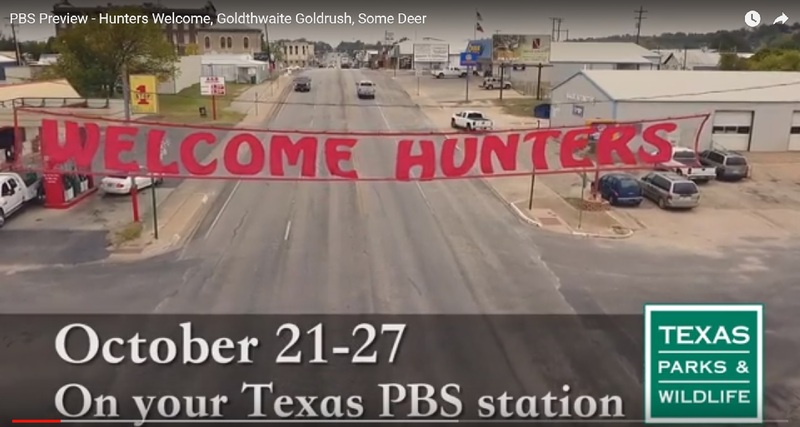 TPW TV- Opening weekend of hunting season in small town Texas. 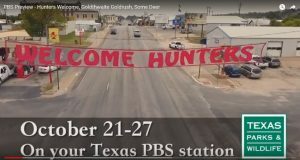 The week of October 21, Texas Parks and Wildlife TV series captures the excitement of deer season opening weekend; series producer, Don Cash. something we’ve talked about for years–being able to show people the economic impact of hunting. I think it’s going to be kind of interesting, actually. Cash said, his team could not have achieved this feat without the kind and enthusiastic support of the people of Goldthwaite. A gentleman named Warren Blesh who’s the President of the Simms Creek Wildlife Management Association went out of his way, and the people of Goldthwaite went out of their way, to help us find people to tell their stories. And really cleared the way for us to come in and run wild with our cameras. And, we showed up with our cameras, and people were pretty excited about us coming in to tell the story of what goes on in a small town in Texas when hunting season rolls around. See this show the week of October 21 on PBS; check your local listings. You are currently browsing the archives for the Hunting category.